Admiral Paul Zukunft spoke on this topic at the Center for Strategic and International Studies on January 16, 2015. This was the second in a CSIS maritime dialog series, the first being presented on an earlier date by Admiral Jonathan Greenert, Chief of Naval Operations. The question and answer session following Admiral Zukunft’s remarks was moderated by Vice Admiral Pete Daly, the CEO of the U. S. Naval Institute. Admiral Zukunft’s Direction (the Commandant’s Direction) for the Coast Guard stresses continuity of command from the President, through the Secretary of Homeland Security, down through the Coast Guard. Hence, his strategy for the Coast Guard develops from the Homeland Security Strategy. Since he plans for a budget driven by strategy, he has had to publish strategies for the Coast Guard across a number of domains. The integration of this different strategies represents his maritime strategy. There are two strategies already published: the Arctic Strategy and the Western Hemisphere Strategy. A third, the Cyber Strategy, will be published soon. His remarks at this session were about the Western Hemisphere Strategy (download here). He talked about the factors that drive Coast Guard action in this hemisphere as he sees them. First, 8 of the 10 most violent nations in the world (measured by murder rates) are in the Western Hemisphere. This violence, often driven by criminal organizations, leads to the flow of illegal immigrants into the U. S. from the south. The flow of illegal drugs continues unabated as law enforcement and the smugglers adapt their tactics to each other. Adding to that is the increase in commercial maritime traffic which will spike after the Panama Canal expansion opens in April 2015. He expects container ships with up to 18,000 TEU and frequent passage of LNG carriers, all of which propose new questions for the safeguard of commerce through sensitive and sometimes dangerous areas. He went on to discuss some of the methods they use to combat the threats, intelligence and risk-based decision making being the two most important. Before concluding his remarks, Admiral Zukunft shared some of the things that keep him awake at night with the audience. These include but are not limited to the following: an adequate budget to buy and maintain the modern ships and aircraft he needs for mission execution; the need for ever-increasing competency in his workforce of active, civilian, reserve and Auxiliary Coast Guard members; positioning, navigation and timing (PNT), especially the availability of an accurate timing signal to back up GPS; and climate change as it impacts Coast Guard mission areas including in the Arctic. 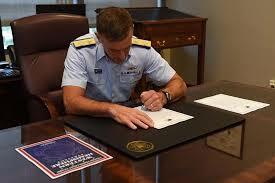 He asserted that the highest priority threats for the Coast Guard today are in the Western Hemisphere.